Better technology tools, improved online learning curriculum and professors better trained to deliver successful experiences to online students — all of which are paving the way to make it easier for students who want to earn a degree online. The popularity of online degree programs is set to boom with colleges and universities across the country introducing more online versions of traditional, on-campus programs. There are thousands of quality degree program choices for those thinking of earning a degree online. A study by Quality Matters, a nationally-recognized nonprofit organization that assures online program quality, states that "online enrollment has continued to outpace overall enrollment in U.S. higher education, fueling greater student and institutional interest". According to findings from Statista, a leading provider of market and consumer data, 64 percent of higher education administrators chose to increase degree program accessibility by creating online programs on par with their existing on-campus programs. College administrators are also adding new features to their online offerings and implementing marketing strategies to attract more online students, according to a 2018 survey by the Learning House. 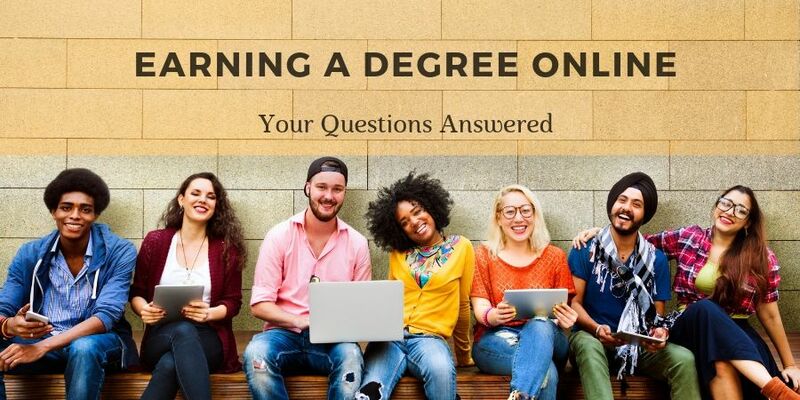 No matter what the motivation to enroll in an online degree program might be, we are sure you have plenty of questions. How do these online degree programs stack up to their on-campus counterparts? And what options are available to online students today? Here you can find the answers to these and more frequently asked questions. What are the advantages of an online degree program? Can I still work a full-time job while studying for my online degree? What kinds of degree programs are offered online? What are some of the best degrees to earn online? What are some of the easiest degrees to earn online? What's the difference between an online and a hybrid degree program? Online learning versus traditional: Which is better? Are online programs easier than traditional on-campus programs? Are online degrees offered by reputable colleges? What factors should I consider while choosing an online degree program? Are online programs cheaper than on-campus ones? Can I transfer credits I have earned previously toward my degree? Does life experience count? Are online students eligible for scholarships, grants and other financial aid? How tech-savvy do I need to be to study for a degree online? Can I still interact with my professors and classmates? How does it work? How do I get the practical experience I need for my degree? Do I need to complete assignments and give examinations? What kind of career support services do colleges offer online students? Flexibility: Most online degree programs allow students to study when it is most convenient to them as long as assignments are submitted on time. This means you can still adhere to work, family or other commitments while earning a degree. No commute: Online degree programs do away with commuting to a class allowing you to study from wherever you might be — as long as you have access to the Internet, of course. Students not only save time by avoiding the commute, but the cost of gas, and parking fees. Additional wear and tear on a car is eliminated, and those who are parents can circumvent costs for childcare. Imagine never needing to brave bad weather driving to your campus! Learn without distractions: Online classes allow you to learn at your own pace without distractions and go over coursework as many times as you need to before moving on. Demonstrate your commitment to your field: Earning your degree despite other commitments can show potential employers you are serious about your field and have the dedication necessary to acquire the knowledge you need to succeed. Demonstrate technical skills: Online degree programs may require you to develop new computer skills. This may show potential employers that you are comfortable with technology and are not afraid to learn new skills in general. Advance your career: Earning an online degree may help working professionals make a career change or move up the career ladder in their own field. Increase earning potential: Data from the Bureau of Labor Statistics (BLS) shows median earnings increase with higher educational attainment, as does the likelihood of working in management or other professional job roles. For example, weekly earnings of an associate degree holder in 2018 was reported to $862, while those who possessed a bachelor's degree was $1,198; while weekly earnings of those with a master's degree were $1,434. Apart from the benefits mentioned above, online degree programs may let you work full-time, transfer credits, use your work experience toward your degree, which may work toward potential savings in time and money. We discuss these benefits in more detail in the sections below. As crazy as it sounds, it is possible to work full-time and study full-time simultaneously. Possible — but not necessarily easy. Studying for your degree while working full-time requires dedication and a clear view of what you want to achieve. Online degree programs typically allow you to access your classes in your free time so you may utilize your lunch breaks, evenings, weekends and even travel-time to catch up with your education. Draw up a study schedule and stick to it. Make sure your family and friends know your study hours so you aren't disturbed. Schedule your vacation time from work around your exam times or when you know you have a major assignment due to help reduce stress. Keep your employer in the loop — you might just be pleasantly surprised about how encouraging they are. Use every spare minute possible — listen to audio lectures while working out or catch up on reading material on the train. It may also be important to stay in touch with your online college as they may be able to help you reschedule coursework or take a mini break if work commitments put too much of a strain on you. Online certificate programs: Not to be confused with professional certifications, these certificate programs are non-degree programs that typically take up to a year to complete. They can act as an introduction to a particular subject and can allow you to apply the skills you learn directly to the workplace. Online associate degrees: Associate degree programs typically consist of general education courses as well as classes specific to your major. Associate degree programs may be terminal degree programs or designed to prepare you to transfer to a four-year college to complete a bachelor's degree. Online bachelor's degrees: Bachelor's degree programs typically build on the topics in an associate degree program to delve in-depth into your chosen field of study. The BLS estimates that about a fourth of the labor force in the country hold a bachelor's degree only. Additionally, it projects that the employment in occupations requiring a bachelor's degree for entry-level roles is expected to grow at 10 percent which is faster than the seven percent for others. Online master's degrees: Master's degree programs typically focus on advanced topics in your field of study. The BLS predicts that occupations that require a master's degree are projected to grow by almost 17 percent from 2016 to 2026. Online doctoral degrees: These are typically the highest academic degrees awarded. Of the 101 occupations typically requiring a graduate degree, 63 are likely to require a doctoral or professional degree for entry-level positions. This is a rather subjective question. Naturally, the "best" online degree would be the one most suited to your needs and interests. That being said, there are some degree programs that lend themselves well to online study. According to a 2018 report by the Learning House, business degree programs are the most popular among online students at both undergraduate and graduate levels. Popular undergraduate online degree programs included psychology and computer science while popular graduate degree program choices included the fields of nursing, education, computer science and social work. Additionally, any good online degree program should be accredited or offered by an accredited online college. If you want to explore online degree programs in more depth, have a look at our article on the Best Online Degrees for 2019 where we've ranked online degree programs by looking at factors like accessible education, strong job prospects and earning potential. What is easy for some may not be easy for others: A popular view is that liberal arts degree programs are "easy" while STEM-based majors are difficult. However, the ease of earning a degree is completely subjective and can vary from individual to individual. For example, someone with an aptitude for math may not find a degree program in English easy. Some degree programs are conducive to online learning: Some fields are easier to study online because the curriculum contains subjects that may not need practical or in-person instruction, so you may not need to travel to a brick-and-mortar facility at any point during your study. "Easy" can mean a reduced load of coursework: Another aspect that might make earning a degree online easier is being able to transfer credits from any previous college program you may have taken toward completing you current degree. According to the Online Learning Consortium, many online degree programs also evaluate "alternative credentials" for college credit, so you can make your life experience count. This may make your course load lighter and therefore make it easier to earn your degree online. The time taken to earn a degree online may depend on several factors like whether you are studying full-time or part-time, the number of transferable credits you may be able to apply to your degree program which can generally help to reduce the time to degree completion. Some online colleges also offer accelerated degree options that may help you complete the required curriculum within a shorter time frame. The only difference between an online degree program and a hybrid program is that hybrid programs require on-campus attendance for certain practical components of the program; whereas online degree programs are 100% online — students need not step on-campus at all. Hybrid degree programs are also known as blended programs and are normally used for degree programs that require practical instruction. Students in blended or hybrid programs usually study theory-based topics online and attend classes on campus for discussions, seminars or practical study. Many science-based, medical and teaching degree programs incorporate this model. Some online colleges may allow you to complete the practical aspects of your degree program at an approved center close to your place of residence, while others may require you to attend short residencies on-campus. Asynchronous: In this format students can access lectures, discussion boards and forums at times that are most convenient to them. Research by Quality Matters shows that online courses are overwhelmingly asynchronous. Synchronous: Synchronous classes are classes that are held at a fixed time. So while students still access their classes remotely, they still need to be present at a particular time to attend the class virtually. Deciding whether to earn a degree online or in a more traditional brick-and-mortar setting may pose quite a problem for some. In terms of the quality of instruction you receive, online degree programs are on par with traditional programs. According to a survey of online students conducted by the Learning House, 85 percent of online students (who had previously attended face-to-face classes) felt that their experience in an online course was actually better than their experience in a more traditional setting and 86 percent felt that the value of education they received met or exceeded the cost. Other advantages of an online degree program lie in the flexibility they allow you in terms of study-time and accessibility. Online degree programs may work well if you are self-driven and have the dedication to see your program through to completion. If you work better in a structured environment and are able to commit to a specific schedule, then perhaps a traditional degree program may work better for you. Additionally, online degree programs allow you to focus on your program without the various distractions present in a classroom. However, they still allow you to interact with your peers through group discussions. Some food for thought: The Learning House survey revealed that 60 percent of students who had a choice between online programs and more traditional ones actively chose online learning. The short answer is no. In fact, some individuals may find them slightly harder as there is no set schedule. When it comes to time management and dedication toward your degree, the ball is in your court. Many online degree programs are nearly identical to their campus-based counterparts in terms of rigor and curriculum, but simply delivered in a different manner so the workload and the required credits for a degree program rarely varies, whether it's online or on-campus. Additionally, the online nature of your studies doesn't mean you'll be exempt from group assignments. In fact, group assignments completed remotely may be viewed as a strong point by potential employers in today's digitally connected world. Yes. Many reputed brick-and-mortar schools now offer online programs. According to a 2019 study published in the Journal of Labor Economics proposes that one of the advantages of an online degree program from a reputable institute is that it expands access to education and increases educational attainment by opening opportunities for individuals who might not have otherwise chosen to pursue higher education. Employers and college registrars tend to pay more attention to an institution's name than whether a degree was earned online or traditionally. In short, reputable institutions give respected degrees. Accreditation: This ensures that an institution meets national standards of quality and accountability. Accreditation helps to ensure students that a program or school has been thoroughly assessed for its offerings, faculty members, and curriculum. This may be done through a regional institution, a programmatic institution, or both. Accreditation ensures that an institution meets national standards of quality and accountability. The U.S. Department of Education helps to set standards to assure quality education and any institution can undergo third-party review by an accrediting agency. Numerous colleges offer online degree programs in a wide variety of subjects. Many of these degree programs are entirely online, available to anyone who can meet the admissions requirements of the university. Theoretical subjects like business and accounting lend themselves well to online degree programs as your entire coursework may be studied in an online format. However, programs like nursing, teaching and engineering which may require hands-on learning can require you to attend face-to-face instruction on-campus at scheduled intervals or at a facility approved by your college. Some colleges even include the cost of an on-campus residency in their tuition fees. Additionally, you may need to complete an internship in order to earn bachelor's degree online. According to a 2018 report tracking distance education in the United States just under half of students enrolled in distance education are taking exclusively online programs. That's nearly 3 million students! Not really. The fees you pay for an online degree program can often be comparable to an on-campus program. While the 2018 Learning House survey of online students found that tuition and fees was the top consideration for online students while selecting a program, students also factored in features like the institute's reputation and convenience of the program to calculate if they received value for money. The survey also found that at the undergraduate level, the common tuition rates were between $300 and $600 per credit. The 2018 Quality Matters Report found that 74 percent of online programs charge the same tuition per course or credit hour as the on-campus rate. While the tuition may often be similar to on-campus programs, there are other factors that may help you save money. Quite a few online degree programs use Open Educational Resources instead of textbooks, allowing you to save money. Transferring previously earned college credits may also help you save on tuition costs. You may also be able to save on living and commuting costs by not having to pay residential fees by living at home. As Maria Hanson, an online degree student puts it, "I did not have to sacrifice my responsibilities. There is no set time to be in class, no worrying about gas money, traffic or finding a parking space. I simply sit at my computer when I am able and ready and go to work." V.J. Sleight gives a great example of one of the biggest advantages of an online degree program, "I had just finished at a brick-and-mortar school and I found it very constrictive. For example, in one of the advanced classes, we had to do a group PowerPoint project -- "because it would look good on our resume" -- but at my age, I had already delivered PowerPoint presentations at national conferences." She went on to further state why choosing an online degree program made better sense to her, "I didn't want to spend countless hours on the freeway commuting, and, locally, the program options didn't fit into my career path." The 2018 Learning House survey of online students states that online degree programs offer many services that traditional on-campus facilities lack. In fact, 85 percent of online students surveyed had prior college credit they could transfer. Colleges that cater to adult learners often have prior learning evaluation procedures in place. A 2017 study of six online colleges commissioned by the Distance Education Accrediting Commission demonstrated that online learning institutions have rigorous prior learning assessment (PLA) measures in place and take into account both formal learning such as corporate training, American Council on Education (ACE) credits and college transcripts as well as informal learning from volunteering and work experience. One issue the study uncovered was that many colleges do not make their PLA measure clear on their websites so it can be a good idea to contact the college you are considering to find out what benefits you can avail of. This may help save on the number of modules you have to take, reduce the time taken toward your degree and also tuition costs. It is important to remember that most colleges only accept college credits from accredited colleges and programs. Bridge degree programs operate in a similar fashion allowing eligible students from a two-year college to earn a bachelor's degree online using their credits from their associate degree. As with traditional students, online students are eligible for federal financial aid. Similarly, the financial aid you are eligible for can vary depending on whether you are enrolled in a full-time or part-time program. The opportunities for scholarships may also vary with some grant-making bodies providing scholarships to both online and traditional students. There are also various scholarships available that cater exclusively to eligible students of online degree programs. However, most financial aid and scholarship programs are only available for students enrolled in accredited online degree programs, so it is important that you check your school or program's accreditation status before enrolling. According to the Learning House, scholarships offered by colleges and online degree programs have a strong draw for online students and even a relatively small amount could sway their decision to choose one school over another. Tuition reimbursement can also be an important benefit you may be able to use if you work full-time. As college finance may be complicated, especially if you are planning on taking a break while studying or in case of an emergency, it is important to speak to your college's financial aid office to navigate through it. Any good college may have competent advisors who are happy to help. It is perhaps best to get one thing clear right from the start -- your degree is not the only criteria employers are looking at when they are thinking of hiring you. They may want to know how good a fit you are with their company and what you can bring to the table. Having said that, they typically also want to know where you received your education. Older students may feel that one of the biggest barriers they have to cross is learning to use the technology needed to study online. However, this is one area where you can set your mind at ease. One of the many advantages of online degree programs is that you don't need to be a millennial or a computer whiz. A decent internet connection, a laptop that can support programs like Word, PowerPoint and Excel and the ability to use email and navigate the internet using a browser are pretty much the skills and tech you need. Most online colleges deliver their classes through Learning Management Systems that you access using your Internet browser. And if this still sounds a bit daunting, there is usually tech support on-hand to help you whenever you need it. As many online degree programs are asynchronous in nature, the question of how much interaction you may have with your professors and classmates may cross your mind. The 2018 Learning House survey found that 57 percent of current and past online students found that being able to interact with their peers was extremely important. Interactions can occur through group discussions, group assignments, email and skype. In fact, many online students that we have spoken to over the years have stated how pleasantly surprised they were about how responsive professors were to any questions and how fast they responded. As Linda Rich, who earned two online degrees, puts it "You actually forget that you're not sitting there and talking to people. The discussion boards can get lively. It depends on the instructors." Hands-on lab work can be an important part of your degree program, especially if you are studying subjects like biology or chemistry. Online degree programs tackle this through a number of different ways -- from virtual labs to having kits delivered to your home. For experiments that require sophisticated equipment or the supervision of your professor, online colleges may either set up a schedule for you to attend laboratory courses on-campus at specific intervals or during short residencies. Online degree programs like nursing or teaching, which require extensive practical experience throughout, may allow you to obtain your experience at an approved center near your place of residence. It can be useful, in that sense, to enroll in an online college with a physical campus near you. In fact, over two thirds of online students live within a hundred miles of their college according to the 2018 Learning House survey of online students. You may also need to complete internships in order to earn your associate degree online or your bachelor's. This can help you gain a sense of what working in your chosen field is actually like. Whether you need to purchase textbooks can depend entirely on your program. Many schools offering online degree programs may provide you with a list of textbooks and reading material you may require before the start of any program. You may also have the option to rent your textbooks through your university. It can also be a good idea to get in touch with your professors to see if the edition of the textbook matters for your program as the price difference for these can be quite high. According to the Learning House Survey, Open Educational Resources (OERs) can lower your textbook costs significantly. Many online degree programs use these along with providing their students access to virtual libraries. Short answer? Yes. Assignments still need to be turned in on time and you may need to sit for proctored examinations depending on your online degree program. Additionally, you may still have to complete group assignments where you collaborate with other students virtually to get them finished. While coordinating across different time-zones can be difficult, the fact that you managed to get a good grade on your group assignment can look great on your CV in today's digital world. Contrary to what one might think, it can be difficult to cheat on online assignments as most universities have anti-plagiarism systems in place. The support systems colleges offer their online students may vary. Career services are a popular feature offered with over 75 percent of online students surveyed by the Learning House stating that their college offered these services. Some colleges allow alumni to continue to access these services long after they have graduated. As graphic design alumnus Cassandra Allen has experienced, "The school provided student job placement. I continue to have the opportunity to utilize the online job board." Career services can also include resume building, interview workshops, job fairs, networking events and more. The Learning House reports that two thirds of the students who did not have access to career services stated that they wished their colleges offered them.